C. Desimone, P. Katchadjian, M. Tacchia, R. Giacchetta - CNEA, Argentina. Suspension bridges are submitted to winds loads and moving live loads. Their security depends mainly from the good working conditions of the ropes that support the suspended span. By stress corrosion cracking, moving to a rupture fragile. Different type of ropes has been development for suspension bridges. Locked-Coil type is a rather old one, constructed with a central nucleus of parallels wires surrounded by several layers of helical wires of S or Z section, galvanised in the outer layers, and forming a very closed part, that not require external protection. Gral. Belgrano Bridge that joint Resistencia - Corrientes cities in Argentina, it has this type of ropes. A rather new design, that we are concerning in this job, are the parallel wires type ropes, as it has Zarate- Brazo Largo Bridge . They consist in a number of parallel wires, by 100 to 350 elements, of 7 mm of diameter each one, protected with a polyethylene layer tube, and with a cable guard running alone the rope in helical way between the wire's strand and the protective layer tube, keeping a minimal gap among them. After tensing the wires, the gap is filled with grout to provide corrosion protection. In the anchorage heads of the rope, the wires separate each other with a small angle forming a cone that is filled with a mixture of epoxy resin and small iron balls, named Hi-Am. At both ends the wires are riveted getting a cold worked head, after cross a perforated plate. The protections can degrade on account of ageing, work conditions and climatic effects, making possible penetration of water in the rope with the consequent corrosion process. This situation could lead to serious failure. In our case, the area of interest was focalised around 50 cm from the rope ends where defects were detected in one of the rope of the bridge. Different methods of non-destructive testing have been applied during inspection of several types of ropes. Visual inspection is effective in exposed wires for ropes that don't have external protection, or just to observe damage in the protective coating. For detection of defects in not visible areas it must be necessary resort to different methods as: electromagnetic, magnetic flux, eddy current, ultrasonic, electron linear accelerators, X and Gamma rays. The parallel wires type ropes that we concern, have a rather thick section in the area chosen for inspection, the wires are not always centred respect to the external tube protection, adding that a cable wire is running in helical way along the rope. These and other reasons make impossible to use most of named methods of inspection. For that reason, according with the design and failure presented on this type of ropes, pulse-echo ultrasonic inspection technique has resulted the most appropriated when applied from the riveting wire ends. Considering plane waves unlimited in space and time propagating in a solid medium of homogeneous material, where there are no boundary effects, the sound velocity is determined by the density r , the modulus of elasticity E, and the Poisson's ratio s , as it is for longitudinal waves, transverse waves and surface or Rayleigh waves. Transverse waves velocity can be expressed also as function of G/r , where G is the modulus of rigidity, also called the shear modulus or the torsional modulus. These velocities are material constants because depend of other constants (for amorphous, vitreous structure material). In crystalline materials, the elastic anisotropy can be pronounced for some of them. Sound velocity can change also due to heterogeneity of bodies, internal of externally applied stress in the material, and temperature (insignificant influence in solids). In sound velocity equations of those waves, neither frequency nor wavelength terms appear. This means that they are free of velocity dispersion. This fact is very important for the use of ultrasonic pulses, witch consist of a band of frequencies. In practice every substance terminates somewhere, and boundaries have a strong influence on the propagation of sound. In some cases, as in plates or rods, boundaries of the specimen may influence the propagation by interfering reflections, or by intentional guiding. Surface waves can travel for long distances along the free surface of a solid object; witch must have sufficient thickness perpendicular to the surface. The amplitude of surface waves decreases rapidly with depth. In case of propagation of any of these mentioned waves in a plate, or other elongated bodies as rods, for example, the wave will be increasingly distorted with decreasing thickness plate, or rod diameter. In a plate, it degenerates into a Lamb wave, or plate wave, with two fundamental types, the symmetric (or stress) wave, and the asymmetric (or bending) wave, and to these also belong an unlimited number of harmonics. Fig 1: generation of a Lamb wave. In rods, there can be generated other types of waves, that can propagate in the form of bulges, as the dilatational rod-wave type, and a large number of bending, torsion, or radial waves, together with their harmonics. Waves propagating in plates or rods undergo dispersion. Their velocities depend in a very complicated way, on the material, on its thickness (or diameter), and the ultrasonic frequency. This kind of waves, that bound to surface (surface wave), or with boundary influenced propagation (Lamb, and rod waves), can be described as guided waves, for distinguish from the two free wave types (longitudinal and transversal). Figure 1, illustrates the generation of a Lamb wave from a zigzag-reflected fundamental unlimited plane wave. For a narrow beam, not influence one another, but for a broader beam, two sections travelling in the same direction partially overlap each other, and hence interference may be destructive or constructive. Important deviations can be found between the actual and the theoretical velocities. One of the reasons can be that in practice pulses are used with a beam of limited width and in a restricted angular range, instead of an unlimited plane wave infinitely long with a single frequency. The pulse consists of not only a single frequency but a band of frequencies witch is wider the shorter the pulse. Therefore, in a pulse of a dispersive wave, the different frequencies contained in it, will have different velocities. It means that a pulse, rather short initially, will be increasingly distorted and usually broadened during its transmission. (See Figure 12). A measurement of transit time it will become almost impossible. Waves in a cylinder. If a coherent, continuous longitudinal elastic wave of a single wavelength propagates in an infinitely long isotropic cylinder of finite diameter, we expect that the wave fronts will be modified by reflections from the free surface of the cylinder. The particle motion should be just axial near the source but, due to beam divergence, some motion will be converted during reflection with the cylinder boundaries, into radial motion. The wave motion will be a composite of axial and radial particle motion, and so, a composite velocity. An axial strain induces a radial strain and in an unbounded solid are generated the so called longitudinal and shear wave. In the long cylinder, can be in fact be developed longitudinal, torsional, and flexural waves, witch velocities depend upon the relative magnitude of the cylinder diameter d to the wavelength l of the elastic wave. In longitudinal wave propagation, the particle motion is composed of axially symmetric axial and radial components. Elements of the cylinder extend and contract but there is no lateral displacement of the axis. Torsional waves propagates in the cylinder developing a particle motion in a way that each transverse section remains in its own plane, rotating about its centre and leaving the axis undisturbed. Longitudinal and torsional waves are so called symmetric type. In flexural waves, on the other hand, particle motion makes that elements of the cylinder axis move laterally and for that reason this type of wave is called antisymmetric. Longitudinal wave will propagate with velocity Co, controlled by Young's modulus, E, and the density,r , Co=ÖE/r. Torsional waves will propagates with velocity Ct, controlled by the shear modulus, G, and the density,r , Ct=ÖG/r. This is the same velocity as for plane shear waves in a completely unbounded solid, so, unlike longitudinal waves, a torsional wave propagates with the same velocity whatever the lateral dimensions of the cylinder relative to the wavelength. Considering now a finite wave train that start and stop, this is not more of a single wavelength, as Fourier analysis shows, introducing other wavelengths. U = W - l * dW/dl = Cf - l * dCf/dl From the equations follow that the group velocity of a limited duration wave pulse will travel at twice the velocity of a very long pulse. The analysis of equations governing propagation of the three type of waves show that in general their phase and group velocity is a function of the magnitude of the wavelength, l , relative to the diameter, d, of the cylinder, so an infinite number of waves can be propagated, each one is distinguished by a particular particle motion and these waves are termed modes. as a function of d/l . Torsional motion,uq , is zero. Figure 4 show the dispersional behaviour of the phase and group velocity in the first and second longitudinal wave modes in a cylinder, as a function of d/l . Fig 2: particle motion of 1st mode of longitudinal waves. Fig 3: particle motion of 2nd mode of longitudinal waves. Theoretically, if we examine the velocity of the wave, at very small relations d/l (<<1), the phase and group velocities are both controlled by Young´s modulus, E, and the density, r , by Ö E/r . As, however, at relations d/l increasing to values close to one, and bigger, then both velocities approach the velocity of the surface waves on a plane surface. Fig 4:phase and group velocity in the 1st and 2nd longitudinal mode. Fig 5: torsional wave particle motion. a) 1st mode; b) 2nd mode. Torsional waves propagate in a number of different modes, the first one being non-dispersive, with W=U=Ct (unbounded shear wave velocity), but in all the other modes, the phase, W, and group, U, velocity, is a function of the magnitude of the wavelength, l , relative to the diameter, d, of the cylinder, tending to Ct when the ratio d/l increase to values close to one, or bigger. In all the modes, the particle motion, uq , is symmetrical and frequency independent. The uq amplitude for the first mode of propagation increases linearly from zero at the centre of the cylinder, to a maximum at the surface, but showing nodal rings for the second and higher modes of propagation. Axial and radial motion is absent. Figure 6 show the phase (- - - -), and group ( ____ ) velocity dispersion curves for different modes of torsional waves, as function of d/l . In flexural wave propagation a number of modes are possible. The particle motion in the modes is complex, antisymmetric, generally involving axial, radial, and torsional components. Figure 7 illustrates the antisymmetric particle motion in the first mode, as a function of d/l . Axial motion,uz, is detailed only. Theoretically, in all flexural modes in cylinders, at very small wavelengths related to its diameter, the phase and group velocities approach the surface wave velocity,. Fig 6: torsional wave phase and group velocity for different modes. 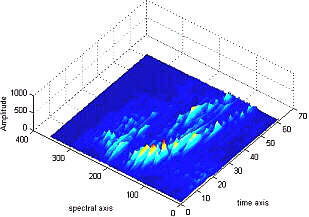 Fig 7: particle motion of 1st mode flexural wave. Experimental tests for inspection procedure. The pulse-echo ultrasonic technique of a longitudinal ultrasonic wave applied from one of the ends of the wire, propagating along it as a composite wave, have been chosen as the most appropriated one for getting a rope inspection procedure. Laboratory experiments were performed for examining the pulse-echo ultrasonic responses on individual similar wires, and on realistic test specimens. Considering that different modes of ultrasonic waves can exist during propagation into wires, studies were performed looking for frequencies appropriated for giving conditions to get good sensitivity and transmission, and low attenuation. a broken rope, where artificial reflectors have been realised on sound wires, and other damage wires were chosen with a process of corrosion. An original sound piece of wire, 800mm length, was chosen as reference of the back wall ultrasonic echo. Time of flight, amplitude, and frequency spectrum of the back wall echo were measured with the wire in air, and also tested submerged in water to analyse the attenuation effects due to leakage of energy into the surrounding medium. Figures 8 and 9 show both measurements, in air and water, performed with a 2.25 MHz transducer. Back wall echo ultrasonic signal with the wire submerged in water has loos of around 10 to 14 dB respect to the signal in air. Other frequencies, from 2 MHz to 10 MHz, were also used. The frequency spectrum of the back wall echo of any one of these frequencies, used for ultrasonic testing of the bar, show a succession of narrow peaks of frequency, with similar values for all of them, separated each peak on around 540 kHz one another. The bigger the diameter, d, of the wire, the shorter the step separation of each peak of frequency. Measurements also show that the higher the frequency the shorter the time, as can be seen the Time-Frequency distribution in Figure 12. Fig 12: Time -Frequency distribution of a pulse US echo. This behaviour of a pulse wave propagation along the bar, show the system as a filter for some frequency components, during short-range steps. All induce, therefore, to use test frequencies as close as possible to the peak of frequency spectrum. This is corroborated in some modelled and experimental works . According with this reference paper , the modelled attenuation curves applied to a wire of 7mm diameter, shows peaks of minimum attenuation around 2.1 MHz, 4.8 MHz, as many more. Additional measurements were taken, as for example on a 7mm steel bar 800mm long, with a 1.5mm (20% loos of section) saw cut notch 600mm from the front face of the bar, as Figure 10 shows, and on another bar, removed from a broken rope with a process of corrosion, as can be seen in Figure 11. The A-Scan representation of the a pulse echo signal from the corrosion process of Figure 11, located around 520mm to 720mm from the end coupling face of a bar 2.4m long, tested in air, it is shown in Figure 13 for 2.25MHz. Fig 13: 2.25 MHz echo from corrosion of Figure 11, (wire in air). Experiments were performed on some realistic test specimens, as a piece of rope formed with a strand of more than 100 parallel steel wires, 7mm diameter, embedded in grout, and protected with a polyethylene layer tube, as Figure 14 shows. Fig 14: Piece of rope. A peripherical wire 870mm long, in contact with 550mm of grout, have been chosen to study the pulse echo ultrasonic responses from the back wall of a saw cut wire face. In Figure 15, it can be seen the A-scan and the frequency spectrum of the back wall echo using a 5MHz transducer. A 1.5mm deep saw cut notch, similar to that in Figure 10, it was performed on the same peripherical wire of the piece of rope, after the last measurements. The notch is located at the far end of the 550mm length of grout, to 700mm from the front face of the wire 870mm long. Different test frequencies, from 2MHz to 10MHz, there have been experimented to analyse the ultrasonic response of the 1.5mm saw cut 550mm into the grout. The A-scan and the frequency spectrum of the pulse echo signal is represented in Figure 16 for 2.25MHz, and in Figure 17 for 5MHz. Fig 15: MHz Back Wall echo of a peripherical wire of the rope. Fig 16: 2.25 MHz echo signal from a 1.5mm deep saw cut in the same preceding wire. Fig 17: 5 MHz echo signal from a 1.5mm deep saw cut in the same preceding wire. After these laboratory experiments, test procedure have been elaborated for inspecting ropes in the bridge of Zarate-Brazo Largo. The wire surface ends of the rope must be conditioned to get a good coupling of the ultrasonic transducers, which it is very important for the performance of the test. The test procedure has been applied in some ropes of the bridge, showing good results for getting signals from broken wires and incipient corrosion process, into the test range not further than 1m. 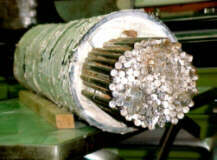 The results mentioned above, as well as laboratory experiments on wires as in-service inspection of ropes, induce that ultrasonic pulse-echo inspection technique applied from the riveting wire ends of the particular type of ropes, can be used with rather good reliability. The filtering behaviour of guided ultrasonic waves on some frequency components, leads to use a well defined range of frequencies, preferably centred on the peaks of frequency of the frequency spectrum of echo signals, for each particular diameter of the bar, taken of course in account the material damping effects during propagation of the wave. Ing. Tomás A. Del Carril, "Reparaciones en los puentes de Zarate-Brazo Largo", Revista Ciencia y Técnica, 1997, p.p. 31-38. "Ultrasonics", Dale Ensminger, Second Edition. Ultrasonic testing", by J. Szilard, 1982. Pavlakovic, Lowe, Cawley. "The inspection of Tendon in Post-Tensioned Concrete Using Guided Ultrasonic waves". 7TH European Conference on NDT, 1998.